The aviation world went bonkers early this week when news emerged that Lockheed Martin has proposed offering a hybrid of the F-22 and F-35 to Japan. The fighter, which would come in addition to the purchase of at least 60 F-35s, would combine elements of the two fighters to presumably produce one of the world’s most formidable combat aircraft. Japan has previously adopted several American designs, including the F-15J and the F-2 (an outgrowth of the F-16). 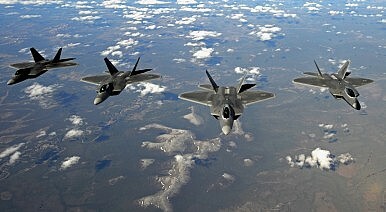 It sought F-22s, but could not acquire them because of the Obey Amendment, a law intended to prevent transfer of the Raptor. The future of Japan’s own stealth fighter project remains in grave doubt after news emerged last month that the country would seek external technological assistance with the program. Japan has already begun purchase of the F-35, but it wants an additional fighter to carry out interceptor duties across its airspace. The threat of incursions from China and Russia has driven this concern. Significant components of the aircraft, notwithstanding any foreign influence, would presumably be built in Japan. Lockheed Martin ran into problems with the U.S. government when it tried to export a variety of stealth technologies to Korea, a restriction which has hamstrung South Korea’s stealth fighter program. Any effort to export what could amount to a variant of the F-22 would also risk running afoul of the Obey Amendment. Kyle Mizokami has some thoughts on what a hybrid aircraft might look like. As Mizokami notes, there’s some sound logic behind the idea of combining the two fighters. The F-22 has a world-beating airframe, but a much older electronics suite than the F-35. A combination, even one which would amount to simply an update of the Raptor, could prove extremely formidable. That said, production of the F-3 (or whatever Japan eventually decides to call the aircraft) is at least ten years away, and possibly longer. It’s also worth wondering whether the United States itself might have an interest in acquiring such a fighter. As Tyler Rogoway has argued, selling the F-22 to Japan would provide a useful economic justification for rebooting the production line in the United States, which would then enable the USAF to acquire more Raptors (or “Super Raptors” or whatever). As a financial and technological collaboration, this could provide the cornerstone of Japanese and American air dominance for the next few decades, dominance that few other countries could consider challenging. That said, the legal and economic obstacles remain nearly as formidable as the notional fighter itself.